Having neat and tidy eyebrows can make such a difference to the way you look, anyone who's ever let their eyebrows grow out wild and then had them tidied up/shaped can tell you this! So what's the best method of achieving fabulous eyebrows?? Waxing, Threading or Plucking? I'll admit, I've never had my eyebrows waxed, although I have heard horror stories of eyebrow waxing gone wrong. Most salons offer waxing treatments, but to find somewhere reliable that offers threading can be a bit more difficult, well in the UK anyway. I've been to some really unprofessional beauticians in my quest for perfect eyebrows, from the woman who stopped halfway through to have a phone conversation, to the salon where they used an old toothbrush to comb my eyebrows! I didn't complain at the time cause I thought I was lucky to have even found somewhere to go for threading, because in a lot of places it's almost impossible to find beauticians who offer threading. Nowadays, threading is a bit more mainstream. This weekend I walked into Selfridges in Manchester City Centre to see a live threading demonstration taking place right in front of my eyes - courtesy of Blink Brow Bars. Blink can also be found in the London branches of Harvey Nichs, Fenwick and Selfridges. Although you might want to take note that they charge an extortionate £17 for eyebrows!! For people that don't live in London or Manchester, and people that can't justify spending £17 to get their eyebrows done, there is somewhere else you can look for beauticians - Gumtree.com. Although it's not a site dedicated to beauty, it's a good site for finding services in your area, and it has most major UK cities listed, as well as some other non-uk cities too. A lot of freelance beauticians post ads there so it's worth a browse. Just search for threading! Here's a random ad I found for a beautician who offers threading: Threading and Waxing Treatments. So lets assume you've found someone you're happy with to thread your eyebrows, but what do you do in between your threading sessions? Personally I suggest using tweezers to maintain your look for as long as you can. Once your eyebrows are all neat it's a lot easier to notice when those hairs start growing back! 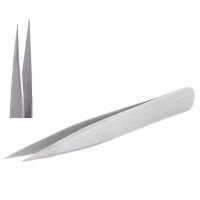 You can get tweezers from most shops, but if you want a pair to be proud of, you have to try Shavata Professional Tweezers. They don't come cheap at £19.50 each, but tweezers are quite a personal item like make-up brushes so you might not want to scrimp on price! 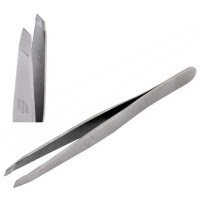 I have to admit the pointy pair do look a bit scary, but I reckon these are the kinda of tweezers you'd keep for life! (as long as you don't lend them to a friend who doesn't give them back) Click here For more info on Shavata's products. Any other suggestions for ways to find a good beautician? and does anyone have any eyebrow horror stories to share? Or is it just me who has all the bad luck?!! In "Merry Hill", Dudley, West Midlands, theres a stand set up and curtains around it for privacy and they offer to thread/wax etc etc. Threading there would be 5/6 squid-a little more compared to what small, local businesses would charge. But given the fact that they're renting out a small space in the middle of a very busy shopping centre, kinda explains the high prices. Although the thought of getting a personal care job in the middle of a real busy shopping centre, doesnt quite appeal to be, despite the curtains; I wouldnt be too comfortable there! I know what you mean - The Blink Brow bar in Selfridges in Manchester is located on the ground floor right near the entrance! Not very discreet at all, but I'm thinking maybe they wanted that location to get people interested and create a bit of a buzz. I do recall seeing quite a few women watching in fascination as someone had their threading done there. I work in Bond Street and there is a really great salon called 'Top Nail's just near Green Park Station and they only charge £8 fo excellent work. It is not as high class as standard Bond Street salons, but they know what they are doing, and for London, that price is unbeatable. Or Fenwicks has the slightly less extortionate price of £15. Otherwise, head down to Ilford to real Asian land and get eyebrows done for £3 at a great place called Naz and Nad, but is only for those who live in NE london. I'll let you on in a litlle secret - I have not yet plucked my eyebrows!! I intend to do it this summer, but I actually like them. They are big and bushy(!) but I would want them to stay big, just neater. But isn't it a real hassle? Doing my upper lip is. Maybe I'm just too lazy. Wow lots of money..here in the USA you can easily find a range between $5-$8 which is 2.50-4 UK pounds. But the American shops will chart $10-20...but I prefer the Indian ones obviously because they know threading. I have threaded mine in various places and I've realized you should stick to one lady and thats it. Problem is the ladies move or are not the day there when you need threading. I've had mine ruined when the arch has gone to going round, going way too thin, and not even eyebrows. The pain is too much for me, I rather handle waxing than threading, so I pluck my own. I love my shape, plucking takes more effort and time but I am very picky about my eyebrows. I don't like too thin and usually when Indian girls get them threaded its the same roundish long look. I like mine long as my eyes a big thick in the front and then slowly thinning but with a nice arch. Waxing is too dangerous..I waxed one of my eyebrows ends too much and it was way too short for 2 weeks, thank god my eyebrows are black so I could use the eyeliner pencil to fill it in. Perfectly shaped eyebrows are essential for female grooming and can, if done properly, enhance and change your face. I go to Jannat on Crawford Street near Baker Street in London and I can honestly say that they are London's best kept secret. Try them out, they can be googled.